Having a home with a smart control system can be really handy, but the problem is that these systems are expensive and can be quite difficult to setup. If you are looking for a much more affordable yet still very functional alternative then WiOn™ is the product that you will want to use. As seen on www.buywion.com, Wi On is very simple to use. First, you need to download the device's iOS or Android app. Then, plug the WiOn onto an electric socket. Once that is done, plug the device that you want to control into the WiOn. Then, simply connect your WiOn devices to the app on your smartphone through your home network and you are good to go. With this setup, you will be able to have smart control of your devices without having to do extensive setup work. Also, the WiOn app is very intuitive to use. Not only will you be able to turn connected devices on or off remotely, but you will also be able to set times when to turn on or off your devices. 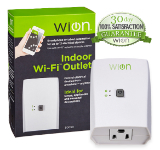 Also, you can connect up to 12 WiOn devices to your smartphone app giving you many options as to which devices in your home you want to control. Reviews also love that a WiOn setup is much more affordable than a full on smart system or buying native smart devices. This means that you will be able to save a lot of money yet still get optimal control from your home devices. Use the links below to find the best offer on WiOn™.